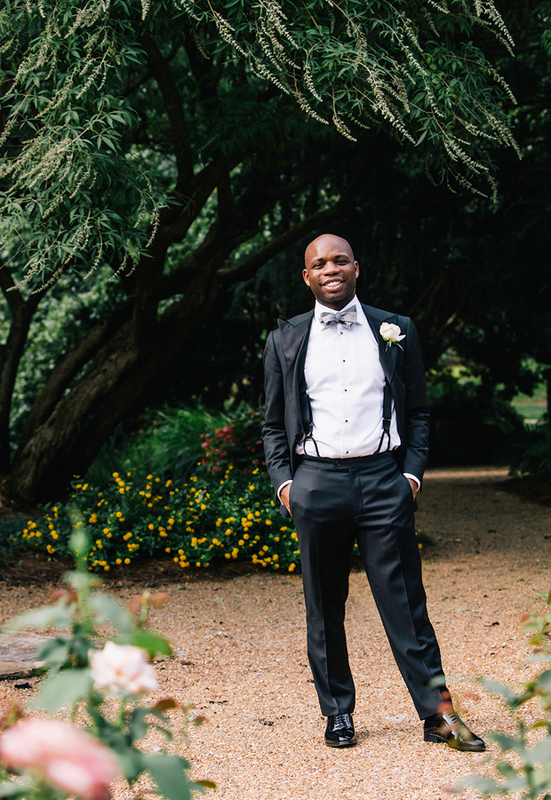 Ryan & Katie were married at Foxhall Stables this spring and we loved styling his and groomsmen's look. Ryan wore a midnight blue Paul Betenly tuxedo with a black shawl lapel, and we styled his groomsmen in a charcoal tuxedo with black lapel to tie it all together! It's all in the details. They can make or break your wardrobe, so we're giving you some tips on how to polish your look for your wedding day as well as tips to look your best in photos. COAT- Always button your coat throughout the day until the reception. Keep it buttoned unless you sit down, then unbutton your coat. If your jacket is unbuttoned, your hands should gently tuck your jacket back before you put your hands in your pockets. PANTS - A mid-break length on pant hem is most appropriate for formal, most timeless. Don't load your pockets. Keep your look clean and pants smooth and crisp. Any object in your pocket will cause creases. SHIRT CUFFS - Make sure your shirt cuffs come out 1/4" to 1/2" from the edge of your jacket/wrist. ACCESSORIES - All metal accessories should match - wrist, watch, cufflinks, tie clip. Be sure to keep accessories simple with matching finishes and don't wear everyday jewelry or sporting gear. BOW TIE - When possible, bow tie should always be hand-tied for a thoughtfully elegant look. A hand-tied tie is worth the investment and completes the look. LONG TIE - A long tie should hit top of waistband on your pants. A single or double-windsor knot works best formal with moderate spread for the shirt collar. BOUTONNIERE - A fabric or metal lapel pin is best, as it won't droop or wear throughout the day. If you do wear real flower or greenery, make sure it's small & simple, otherwise it can throw off the balance of your look if it's too big. SOCKS - Fun patterns and colors are appropriate. For formal, keep it classy & elegant with a solid or simple stripe. Last but not least, always be a gentleman. It is completely in style. Here's a look at some of our favorite white jackets. We are excited to announce our SUMMER CUSTOM SUITING SALE!!! Choose from a variety of beautiful cotton, linens or lightweight wool fabrics to create the best comfort and breathability for summer suiting. Our selection is curated for unique styling and exceptional quality. Build patterns and color into your look with accessories to enhance and personalize your attire. Pack it all in one of our Garment Weekender travel bags, $395, and you're on your way to the next summer adventure! It's always the little details that are so important, and it's no different with your clothing. In menswear, the smallest details can make the biggest difference. Here's some tips for ensuring your look is flawless!